These are not your traditional chips. Our thick corn tortilla chips are just like the ones in Mexico, served with roasted tomato and serrano salsa, our delicious escabeche, and our seasonal salsa. Freshly made to order Monterrey-style, with cilantro, onions, tomatoes, and jalapeños served on the side. Comes with a side of homemade totopos. Three traditional guacamoles: guacamole de molcajete (mashed avocado topped with roasted chile serrano and lime), guacamole del mercado ((chunky avocado with pico de gallo), and creamy guacamole topped with "chales"­ - super crispy pork carnitas. Fish ceviche mixed with our Acapulco-style salsa, served with totopos. Fish ceviche mixed with pico de gallo and salsa de chile habanero on the side. Shrimp ceviche with shaved cucumber and a citrus-based sauce. 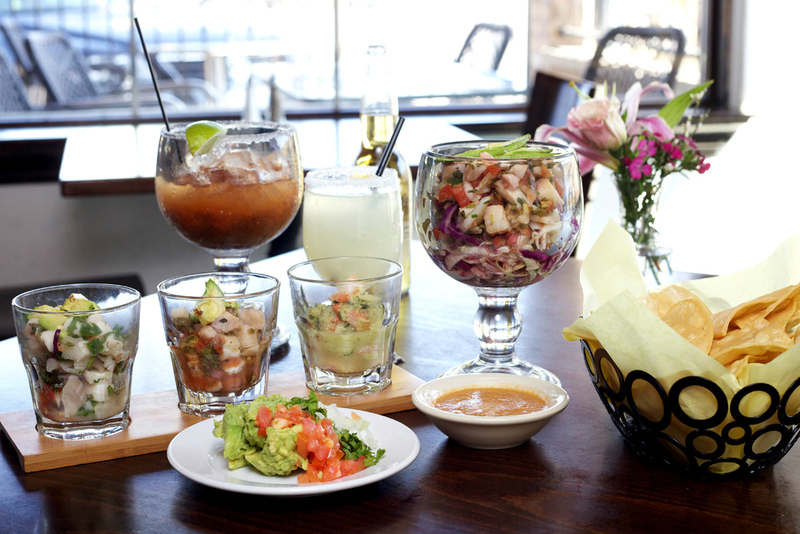 A sampler of our three delectable ceviches. Melted Monterey Jack cheese topped with rajas (roasted chile poblano strips and sauteed onion), , served with flour tortillas. Our queso fundido topped with your choice of chorizo verde de Toluca or chorizo rojo. Our recipe is different from the Tex-Mex classic, featuring melted Monterey jack and cotija cheese topped with cooked salsa fresca, served with homemade totopos. Homemade corn or flour tortillas (3) filled with Monterrey Jack cheese. +Add chicken or beef fajita, mushrooms, or rajas. Shredded pan-seared tilapia rolled in crispy corn tortillas topped with El Mesón slaw and garnished with chipotle mayo. A very traditional street antojito. Four fresh masa boats filled with black beans, topped with salsa verde, and garnished with queso cotija and chopped onions. A Mexico City classic! Grilled sirloin with caramelized onions, garnished with cotija cheese and served with avocado salsa. Pork marinated in achiote and chile guajillo, grilled with fresh pineapple and garnished with onions and fresh cilantro, served with avocado salsa. Same as our pork pastor but with succulent shrimp. Outstanding! Our vegetarian antojito. Sauteed baby spinach and caramelized onions garnished with cotija cheese and served with chipotle salsa on the side. A classic street antojito! A sandal-shaped thick tortilla filled with black beans topped with salsa roja (spicy), and garnished with cotija cheese, fresh onions, sirloin a la plancha, and a little Mexican crema. Five (5) mini-flautas filled with shredded beef cooked in tomato sauce with chile morita, garnished with crema mexicana, queso cotija, and a side of chipotle salsa. Garnished with cotija cheese and tortilla strips. Add chicken, beef , or shrimp for an extra charge. A mix of local lettuces, tomatoes, avocado, red onion, and seasonal fruit, garnished with cotija cheese and chiles anchos. Your choice of balsamic vinaigrette or chipotle ranch. Romaine, avocado, tomatoes, onions and cotija cheese. Chicken soup spiced with chipotle, served with rice, onions, cilantro, avocado, tomatoes, and tortilla strips. All entrees served with two tortillas, rice, and your choice of black or peruano (navy) beans. Lightly battered roasted chile poblano stuffed with ground sirloin, cooked with potatoes and raisins, topped with ranchero sauce, and garnished with queso fresco. Dried chile ancho stuffed with three cheeses, dried cherries, onions, and pine nuts, topped with a chunky tomato, tomatillo, and onion sauce. Iconic roasted chile poblano stuffed with pork picadillo cooked with dried and fresh fruits, almonds, sherry, and white wine, topped with an extra special walnut-almond sherry sauce and garnished with pomegranate seeds. Braised sirloin cooked with tomatoes and a little chile habanero. Marinated in our special dried chile seasoning, grilled, and served over grilled onions with a side of guacamole, rice, and your choice of beans. Tender pork cooked in a flavorful green tomatillo sauce. Traditional northern-style pork in a sauce of guajillo and ancho chiles. Tender pork marinated in achiote and citrus, slowly baked in banana leaves, served with pickled red onions and habanero salsa on the side. Grilled pork marinated in achiote and guajillo chile, sauteéd with diced grilled pineapple, served with fresh cilantro, onions, and lime wedges. Shredded chicken breast cooked with onions, tomatoes, and chipotle. Add a side of homemade chorizo to make the flavor more traditional! Shredded chicken breast in our special green mole, made with pumpkin seeds, tomatillos, chile serrano, and fresh greens. Chicken breast chunks in our traditional mole rojo prepared with dried chiles, nuts, and spices. Slightly sweet but a little spicy and delicious! Marinated chicken breast that is grilled and served on top of grilled onions. Comes with a side of guacamole, rice, and your choice of beans. Pan-seared fish fillet or five shrimp, finished with our crispy garlic olive oil, served with a side of chipotle mayo. Stuffed with your choice of shredded beef, chicken, cheese, or veggies. +Rancheras: with a mild tomato and chile serrano sauce. +Verdes: with tomatillo and chile serrano sauce. +Suizas: with tomatillo and cream sauce. +Mole rojo: the traditional mole from Puebla. +Mole verde: with our special green mole. Not your traditional enchilada! Tortillas dipped in a dried chile salsa, cooked on the griddle with melted cheese and fresh onions, folded and topped with cotija cheese. Served with one cheese enchilada with your choice of sauce, a side of guacamole, and a side of homemade chorizo rojo or verde. Directly from our grill! 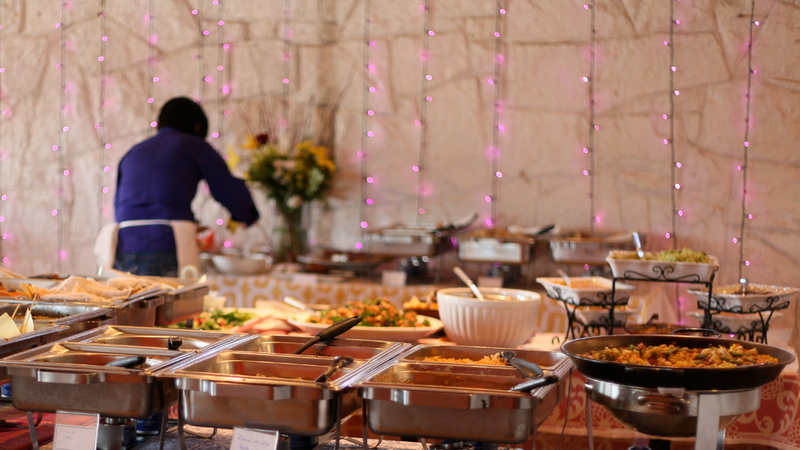 Four grilled shrimp, chicken fajita, beef fajita, chorizo verde or rojo, two quesadillas and four sides of beans. *Served with El Meson's potatoes and your choice of black beans or peruano (navy) beans. Crisped corn tortilla topped with two eggs any style and ranchero sauce. Lightly crisped corn tortilla topped with two eggs any style and our special mole sauce. Eggs scrambled “a la mexicana” with onions, tomatoes, serranos, and tender sauteed cactus strips. Crispy strips of corn tortilla topped with chile guajillo salsa and two over-easy eggs. A specialty form the state of Yucatán. Two crispy corn tortillas with a layer of black beans, topped with two over-easy eggs, ranchero sauce, cubed ham, and green peas, served with a side of fried plantains. Crispy corn tortilla chips slightly tossed in our green tomatillo or red tomato sauce, topped with two eggs any style and queso fresco. Scrambled eggs with crispy tortilla strips, tomato, onion, chile serrano, cilantro, and cheese. Same as migas, but cooked with our house-made chorizo - a spicy Mexican sausage. This is one of Puebla’s most traditional street antojitos. A small bolillo, dipped in a dried chile sauce, then toasted and stuffed with chorizo and potatoes, garnished with lettuce, queso cotija, and Mexican cream. Served with a side of avocado salsa. Short stack, topped with butter and served with syrup. Hand-battered Texas toast served with syrup. Fruit cocktail served with vanilla yogurt, coconut-almond granola, and local honey. Slow-cooked beef tongue tacos, garnished with fresh cilantro and onions, served with a side of guacamole and a side of beans of your choice.